As millions of Dukan Dieters around the world know, delicious food and permanent weight loss can go hand in hand. Now comes the Dukan Diet Cookbook—already an international bestseller— the must-have resource for making the Dukan Diet successful and delicious. Introduced in the phenomenal bestseller The Dukan Diet, Dr. Dukan’s four-step plan rejects counting calories and instead harnesses the power of pure protein, empowering you to achieve your “True Weight” and keep the pounds off forever. 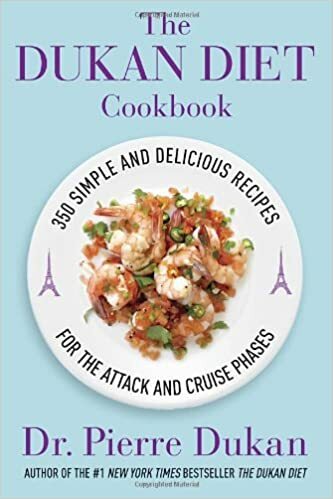 The Dukan Diet Cookbook is filled with over 350 simple, French-inspired recipes for the two most challenging phases of the diet—the protein-only Attack phase and the protein-and-vegetable Cruise phase. From Crispy Chicken Wings and Ham Soufflé to Turkey Meatballs with Rosemary and Mint, Mussels Provençal and Curried Turnip Soup to Flourless Chocolate Cake and a scrumptious Vanilla Cookie—plus all-new recipes for Shirataki noodles—the recipes in this book prove you don’t have to sacrifice great taste and satisfaction in order to lose weight. Illustrated with sixteen pages of delectable color photographs, The Dukan Diet Cookbook is the essential companion to the Dukan Diet.